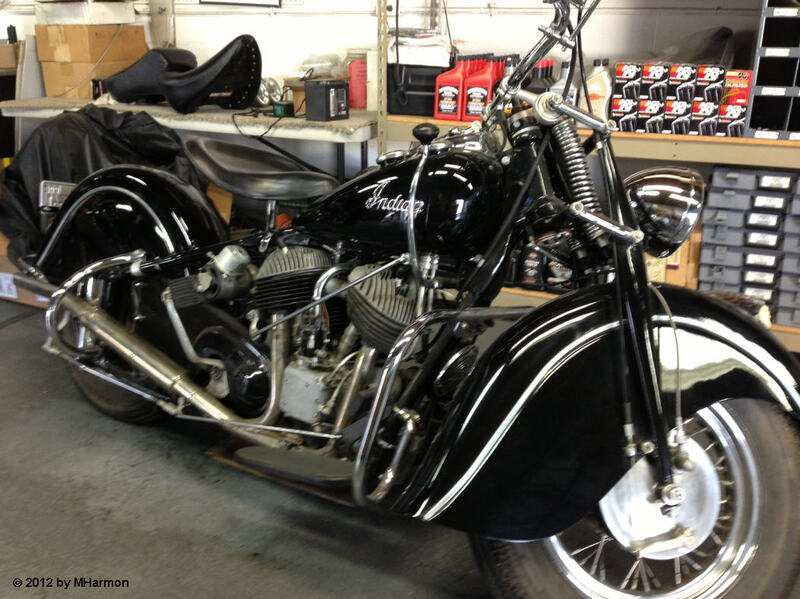 Knowing my long-term obsession with Indian motorcycles, Mike Harmon emailed the photos in this post to me a few weeks ago. He had been at California Rider in San Bernardino getting some maintenance done on his Harley when he spotted this beauty. The photos were made with his iPhone 5. 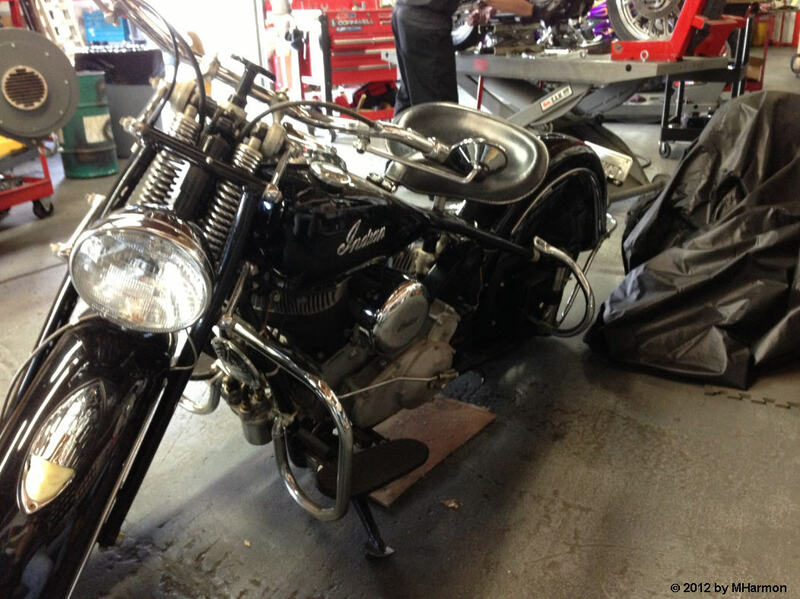 The story behind this motorcycle is that the rider is 85 years old and no longer riding. None of his children want the motorcycle. He decided to sell it (that had to hurt!). He is asking $25,000 US Dollars for it. This bike is in very good running condition. No rust or pitting on the chrome, no dings in the paint, and the pipes show no sign of blueing. All parts are original except for the lens in the fender light, which was replaced because the original was cracked and severely yellowed. 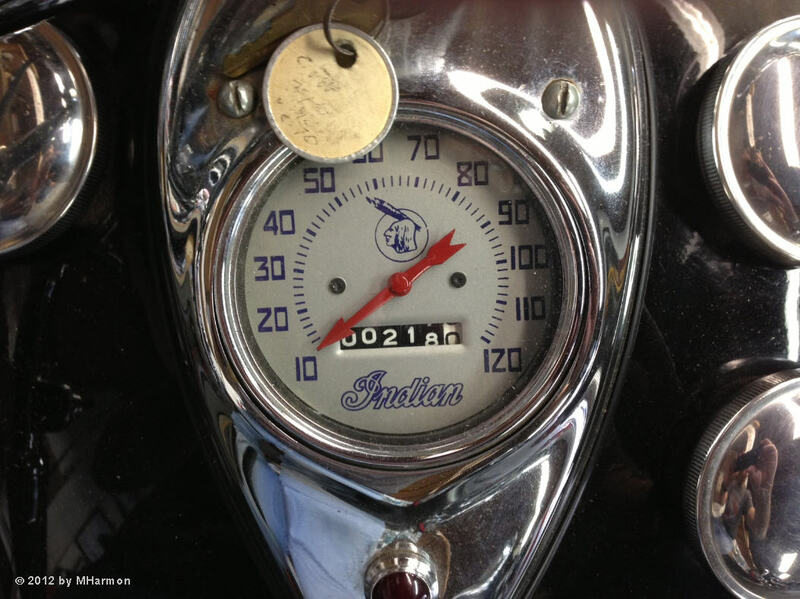 It seems likely that the odometer reading shown below reflects the number of miles since the engine was rebuilt. The 1948 Chief was 100.5 inches long with a wheelbase of 68.4 inches. Equipped with a 74 cu. in. V-Twin engine, it was capable of a speed of 85 Miles per hour direct from the factory, and 100 miles per hour when “fully tuned”. California Rider had this particular bike sold, but the prospective “buyer’s wife wouldn’t let him have it” (for more on this aspect of the story, see this post). The above information was current at the end of October. If you are a prospective buyer, phone California Rider (909-798-7798) before traveling to look at the bike, just to make sure that it is still available.